We have been enjoying our winter break and taking the opportunity to sort things out in the coffee shop for next season. Last week Bill’s old schoolfriend John came down to install a new double sink in the coffee shop kitchen, assisted by Bill. 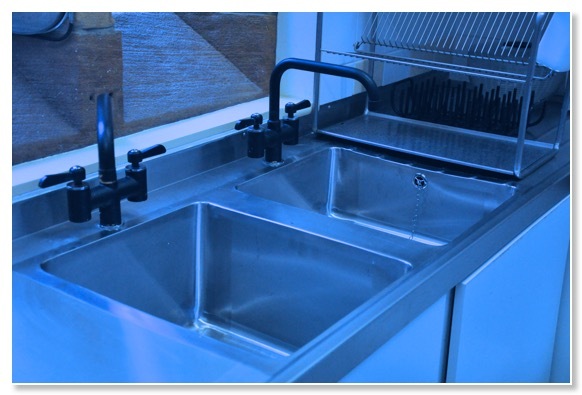 The sink is tailor-made to fit the non-standard space. At the time we opened we had made do with two domestic single sinks side by side but it was always a compromise and a bit impractical. Bill was extremely nervous having had to specify the size of the sink down to the millimetre and worried that he might have got it wrong. You can’t just shave a bit of stainless steel like you can a piece of timber. He’d made a schoolboy error when originally sending in the measurements - six centimetres is very different from sixty - but picked up the problem when the company sent through the approval drawing. John fitted the sink in record time and, although washing up will never be a joy, the new arrangement will make it easier and more efficient. A mystery water leak appeared just after the sink was fitted after heavy rainfall in the night. A pool of water on the floor with no obvious source of leaking up above. After some head scratching we managed to trace it to a waste pipe attached to a down pipe from the roof gutters by the kitchen. On inspection, the downpipe was blocked at the bottom with a solid plug of leaves. In heavy rain the water backed up the pipe until it reached above the level of the incoming waste and poured back into the coffee shop along it. Realising that feebly poking sticks at the bottom of the drain wasn’t going to work Bill headed off to our local builders’ merchants for a set of drain rods. He hadn’t realised it was the Christmas equivalent of ‘Black eye Friday’ when - in this part of the world at least - builders finish work early and start the upcoming holiday with a festive drink. The place was crammed, beer pumps had been installed on the counter and lots of men in big boots and Santa hats were enjoying a beer and a chat before heading home. Having found the one member of staff still serving building supplies rather than beer, Bill made his purchase. After some serious pushing and pulling the rods cleared the plug of leaves and fixed the problem. Our holiday this year included some time in Paris. Visits to cafes on both banks of the Seine reminded us how difficult it can be to get a good cup of coffee in the French capital. Worse than some of the stuff we’ve endured at motorway services with stereotypically offhand service as an added extra. We stared unbelieving at the steam wand on the coffee machine in one of the places which had developed an impressive stalactite of congealed milk. The art we saw later made up for it though and we did find a lovely creperie that did everything very well, with friendly staff too. We’ve polished the floor and oiled the counter after a satisfying deep clean of the whole place. We’ll test out the new arrangements in the coming week when various parts of the family join us for the holiday with a big meal in the coffee shop in Boxing day. In the New Year we need to get on top of our new responsibilities as licensed premises with a new operating schedule and fire safety assessment to put in place before we reopen in February half term.